This morning in Huntington at 7:15AM it’s currently a balmy 25 degrees under mostly cloudy skies. Winds are out of the southwest at 0-4 mph. Relative humidity is 47%, dewpoint 7, barometric pressure 29.96″. We have 5.5″ of snow on the ground. Yesterday’s high was 27, and the overnight low was 24. We’ve got some active weather going into the weekend. A frontal boundary moving through the region this morning will give way to high pressure by this afternoon which will remain over the area overnight into the early morning hours Saturday. We’ll see mostly cloudy skies with a slight chance of snow showers this morning, then partly sunny skies this afternoon. It will be warmer with highs around 30 and south winds 10 to 15 mph gusting up to 30 mph and becoming westerly this afternoon. Chance of snow is 20%. Tonight should be partly cloudy with lows around 18 and west winds around 10 mph until midnight, becoming light and variable. A warm front and associated low pressure system will move through the region Saturday bringing mostly cloudy skies and chance of snow in the morning, then a wintery mix of snow or rain likely in the afternoon. We could see snow accumulations of a dusting to 2 inches with higher amounts north and in the mountains and a higher chance of rain in valley locations. Precipitable moisture is only on the order of 0.10 to 0.50″ so there’s not much to work with here either way. Highs will be in the lower 30s with light and variable winds, becoming southerly around 10 mph in the afternoon. Chance of precipitation is 70%. Saturday night snow is likely with additional light snow accumulation. Temperatures will remain near steady in the lower 30s with south winds 10 to 15 mph and gusting up to 25 mph. Chance of snow is 90%. Snow will linger into Sunday before an advancing cold front clears out the departing low. We’ll see mostly cloudy skies with a 50% chance of snow showers. Highs will be in the mid 30s with west winds around 10 mph and gusting up to 25 mph. Sunday night should be partly cloudy with lows around 15. Burlington norms for this date are highs of 28°F and lows of 10°F. Tomorrow will be 2m 31s longer. The Moon is a waxing crescent, 14 hours old with 1% illumination. 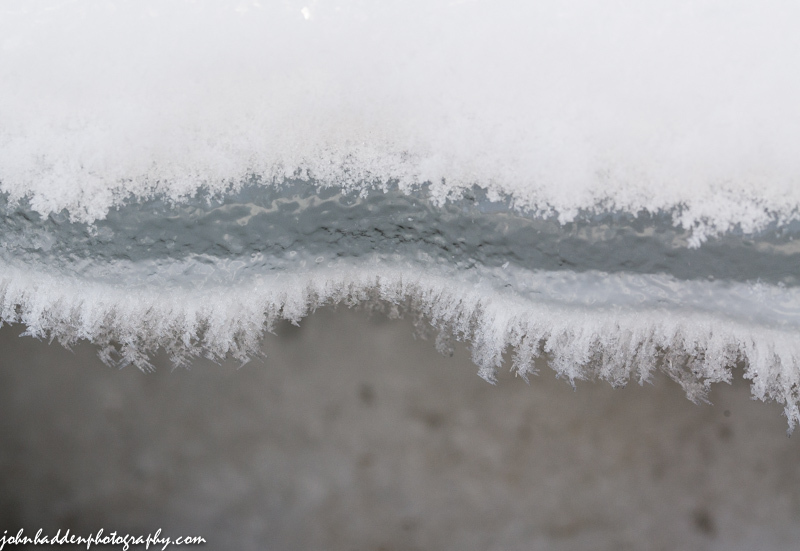 On cold mornings, the interaction of dry frigid air above and and moist water-warmed air below make for some interesting ice formations. 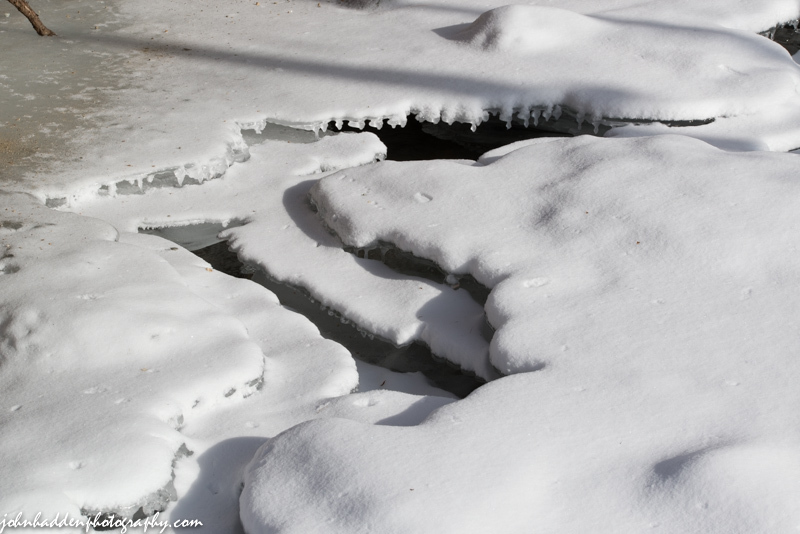 A close look at the ice covering Fargo Brook reveals this interesting sandwich. Nikon D600, Sigma 105mm lens, IOS 320, f/13, 1/100″ exposure. This morning in Huntington at 6:55AM it’s currently 2 degrees under mostly clear skies. Winds are calm. Relative humidity is 88%, dewpoint -1, barometric pressure 30.32” and rising. We have 5.5” of snow on the ground. Yesterday’s high was 16, and the overnight low was 1. High pressure over the region today will give way to a weak frontal boundary tonight into Friday, bringing light wintry precipitation to portions of the north country. We’ll see mostly sunny skies today with highs in the mid 20s and south winds 10 to 15 mph gusting up to 30 mph this afternoon. Tonight should be partly cloudy until midnight, then becoming cloudy with a 20% chance of snow showers as a weak cold front approaches. Lows will be around 14 with south winds 10 to 15 mph gusting up to 30 mph. Friday should be cloudy with a slight chance of snow showers in the morning, then partly sunny in the afternoon as high pressure builds in. Highs will be in the upper 20s with south winds 10 to 15 mph gusting up to 25 mph and becoming westerly in the afternoon. Chance of snow is 20%. Friday night should be cloudy with lows around 14 and southwest winds around 10 mph. Saturday should be cloudy with a 50% chance of snow showers as a low pressure system approaches from the Tennessee River valley. Highs will be in the lower 30s with south winds around 10 mph. Saturday night snow is likely with little or no snow accumulation. Lows will be in the upper 20s. Chance of snow is 70%. At this point, Sunday looks to be snowy, but we’ll be threading the needle temperature-wize, so stay tuned. Last year on this date we had a high of 59 and a low of 38. We picked up 0.16″ of rain and had 4″ of snow on the ground. Record high was 57°F in 2013 (we had the aforementioned 59). Tomorrow will be 2m 27s longer. The Moon is new today, 29d 1h old with 0% illumination. 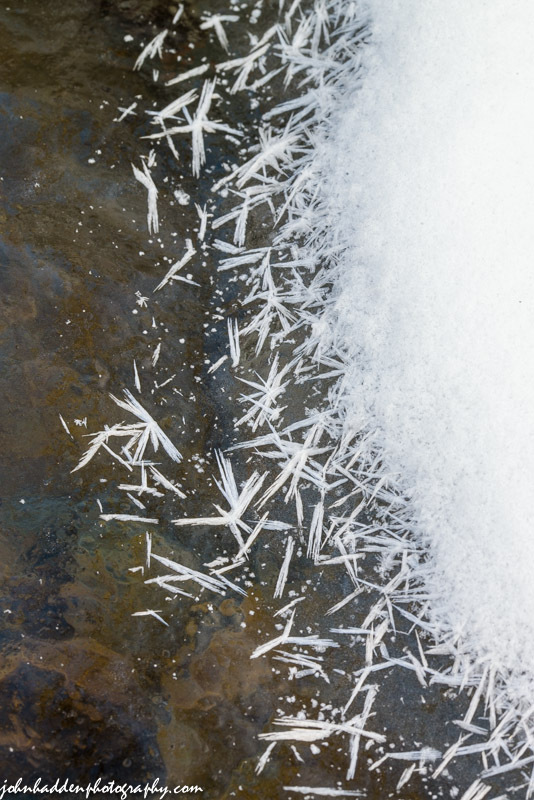 Cold morning temperatures cook up a wide variety of frost crystal formations where warm are from the brook meet the cold air. Nikon D600, Sigma 105mm lens, ISO 320, f/22, 1/13″ exposure. This morning in Huntington at 6:05AM it’s currently -4 degrees under clear skies. Winds are calm. Relative humidity is 79%, dewpoint -9, barometric pressure 30.09”. We have 5.25” of snow on the ground. Yesterday’s high was 16, and the overnight low was -4. We’ve got another cool and mainly dry day on tap. We’ll see partly sunny skies with a slight chance of snow showers this afternoon as a weak surface disturbance move through. Highs will be around 13 with southwest winds 10 to 15 mph. Chance of snow is 20%. Tonight should be partly cloudy with lows around 3 above and southwest winds 10 to 15 mph. Thursday should be partly sunny and milder with highs in the lower 20s and south winds 10 to 15 mph. Thursday night should be partly cloudy with near steady temperature around 18 and south winds 10 to 15 mph. A weak cold front will move in Friday bringing mostly cloudy skies and a 40% chance of snow showers. Highs will be around 30 with southwest winds 10 to 15 mph. Friday night should be partly cloudy with lows 15 to 20. Last year on this date we had a high of 41 and a low of 21. 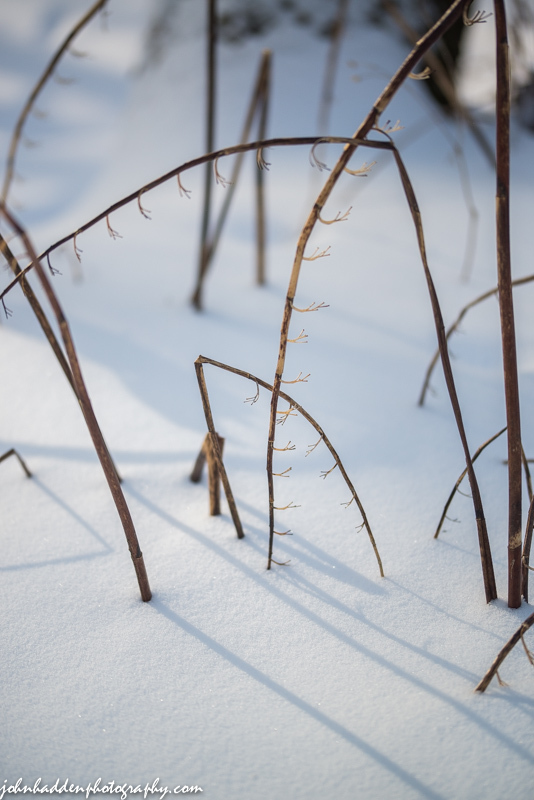 We picked up 3.5″ of snow and had 8.75″ on the ground. Burlington norms for this date are highs of 27°F and lows of 10°F. The Moon is a waning crescent, 28 days old with 3% illumination. 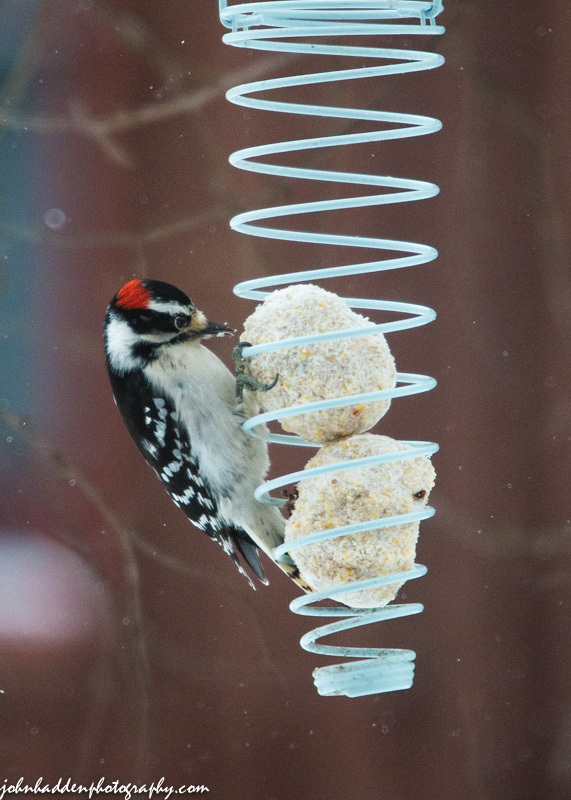 We get a good variety of birds at our suet feeders. This downy woodpecker is a regular visitor along with its larger cousin, the hairy woodpecker. Nikon D600, Sigma 120-400mm lens @ 400mm, ISO 2500, f/5.6, 1/1600″ exposure. This morning in Huntington at 7:05AM it’s currently -4 degrees under mostly clear skies. Winds are calm. Relative humidity is 82%, dewpoint -8, barometric pressure 30.14” and rising rapidly. We got skunked on the anticipated 2-4″ of snow yesterday (sorry to get your hopes up…) and have 5.5” on the ground. Yesterday’s high peaked at 38 at around 8:00AM, and the overnight low was -7. There is a Winds Chill Advisory in effect for our region until 1:00PM this afternoon. Following the passage of yesterday’s cold front, an Arctic airmass has parked itself over over the region and will be with us through Wednesday. We’ll see partly sunny skies today with highs around 10 above and west winds 10 to 15 mph gusting up to 30 mph. Tonight should be partly cloudy and cold with lows around -3 below and southwest winds around 10 mph. Wednesday should be partly sunny with highs around 12 and southwest winds around 10 mph. Wednesday night should be partly cloudy with lows around 2 above and southwest winds 10 to 15 mph. Thursday’s looking partly sunny with highs in the lower 20s and south winds 10 to 15 mph gusting up to 25 mph. Thursday night should be mostly cloudy with a 30% chance of snow showers. Lows will be 15 to 20. Last year on this date we had a high of 23 and a low of 2. We had 4.5″ of snow on the ground. The Moon is a waning crescent (and lovely at that this morning…) 27d 1h old with 8% illumination. With all the freeze-thaw cycles we’ve seen this month, the ice on Fargo Brook has taken on a multi-layered look. There’s very little open water and the sound of the stream beneath the ices is a quiet burble. Nikon D600, Sigma 105mm lens, ISO 320, f/16, 1/250″ exposure. This morning in Huntington at 6:15AM it’s currently a balmy and breezy 25 degrees under overcast skies. Winds are out of the southwest at 3-5 mph. Relative humidity is 79%, dewpoint 20, barometric pressure 29.41” and falling rapidly. We have 5.5” of snow on the ground. Yesterday’s high was 19, and the overnight low was 16. Another clipper will produce snow showers and breezy conditions across the region today. We’ll see snow showers likely, mainly this morning with total snow accumulations of 3 to 5 inches possible. It’ll be breezy with highs in the mid 20s and temperature falling to around 12 this afternoon. Winds will be out of the south at 15 to 20 mph, becoming westerly 15 to 25 mph and gusting up to 35 mph this afternoon. Chance of snow is 70%. Tonight should be mostly clear with a slight chance of snow showers until midnight. It will be colder with lows around -5 below and west winds 15 to 20 mph gusting up to 40 mph until midnight. Chance of snow is 20%. Tuesday should be partly sunny and chilly with highs around 8 above and southwest winds 15 to 20 mph gusting up to 30 mph. Tuesday night should be partly cloudy and cold with lows around -3 below and southwest winds 10 to 15 mph gusting up to 30 mph. Wednesday’s looking partly sunny with highs around 11 and southwest winds around 10 mph. Wednesday night should be partly cloudy with lows around zero. Last year on this date we had a high of 19 and a low of 0. We had 4.5″ of snow on the ground. The Moon is a waning crescent, 26 hours old with 17% illumination. 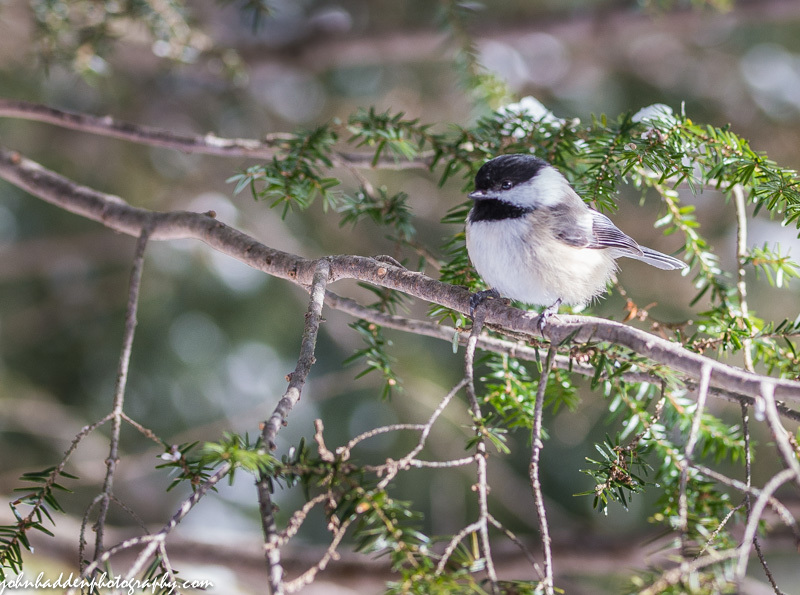 Chickadees are my favorite birds. Their gregarious nature and chattery dispositions are truly charming. We have quite a flock of them at our feeders on a regular basis especially in this cold weather. Nikon D600, Sigma 105mm lens, ISO 400, f/4.5, 1/500″ exposure. This morning in Huntington at 8:15AM it’s currently -7 degrees under clear skies. Winds are calm. Relative humidity is 79%, dewpoint -12, barometric pressure 29.70” and rising rapidly. We picked up 1.75” of new snow and have 6” on the ground. Yesterday’s high was 22, and the overnight low was -7. Morning sunshine courtesy of an Arctic cold front that moved in overnight will give way to increasing clouds as another clipper system moves towards the region. We’ll see partly sunny skies this morning, then mostly cloudy skies later in the day. Highs will be around 5 above with west winds around 10 mph gusting up to 25 mph this morning. Tonight should be cloudy with snow showers likely mainly after midnight as the clipper moves through to our north. We should see snow accumulations a dusting to 2 inches. Lows will be around 3 above with temperature rising to around 13 after midnight as a southerly airflow sets up. Winds will be light and variable becoming southwesterly 10 to 15 mph and gusting up to 25 mph after midnight. Chance of snow is 70%. Monday should be cloudy with a 50% chance of snow showers. Highs will be in the lower 20s with southwest winds 10 to 15 mph gusting up to 25 mph. Monday night should be partly cloudy and cold again with lows around -4 below and southwest winds around 10 mph. Tuesday’s looking mostly cloudy with highs 5 to 11 above and southwest winds 10 to 15 mph gusting up to 30 mph. Tuesday night should be partly cloudy with lows around zero. Last year on this date we had a high of 14 and a low of -3. We picked up 0.10″ of new snow and had 4.5″ on the ground. Tomorrow will be 2m 20s longer. The Moon is a waning crescent, 25d 2h old with 25% illumination. 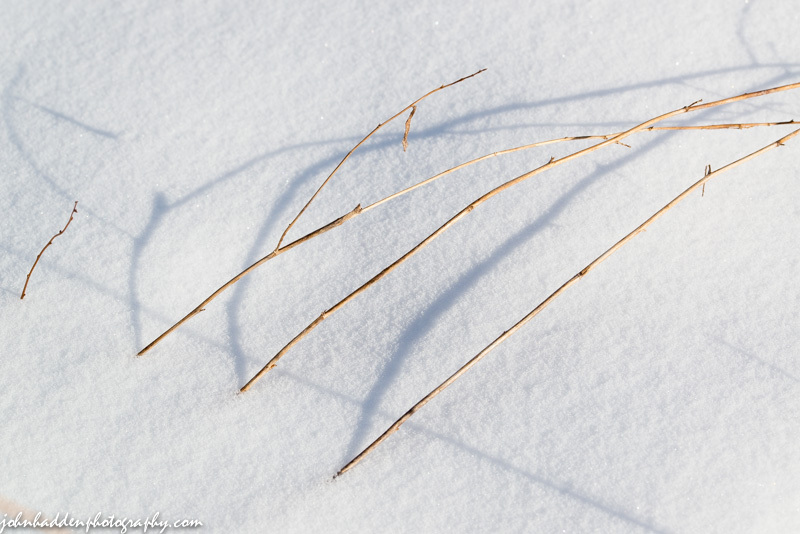 I find the shadows cast by partially covered stems and grasses across the snow to be infinitely interesting. These are in our front field. Nikon D600, Sigma 105mm lens, ISO 400, f/13, 1/800″ exposure. This morning in Huntington at 8:50M it’s a balmy 19 degrees under overcast skies. Winds are out of the south at 0-4 mph. Relative humidity is 59%, dewpoint 6, barometric pressure is 29.58” and falling rapidly. We have 4.5” of snow on the ground. Yesterday’s high was 14, and the overnight low was 14. A trough of low pressure will continue across the region through early this upcoming week with several disturbances producing occasional snow showers.Today a weak clipper system to our north will produce gusty winds and occasional snow showers along with milder temperatures. We’ll see snow showers with areas of blowing snow this afternoon. Snow accumulations should be in the range of 1 to 3 inches during the day. Highs will be in the lower 20s with south winds 15 to 20 mph gusting up to 30 mph. Chance of snow is 90%. Tonight should be cloudy with snow showers likely until midnight, then becoming partly cloudy with a chance of snow showers after midnight. Total snow accumulation from the clipper should be in the range of 2 to 4 inches. Another Arctic cold front will move in overnight with lows around -7 below and south winds around 10 mph gusting up to 25 mph. Chance of snow is 70 percent. Sunday should be partly sunny in the morning, then become mostly cloudy. It will be chilly with highs around 4 above and southwest winds around 10 mph gusting up to 25 mph. Sunday night should be cloudy with a 50% chance of snow showers. Lows will be around 1 above with temperature rising to around 10 above after midnight. Another clipper system will pass to our north on Monday bringing snow showers with possible accumulations of 1 to 3 inches. Highs will bounce up into the lower 20s with west winds 10 to 15 mph gusting up to 30 mph. Chance of snow is 70%. Cold air will again move in behind the departing low Monday night bringing partly cloudy skies with lows -5 below to zero. Last year on this date we had a high of 13 and a low of -8. We had 4.5″ of snow on the ground. Tomorrow will be 2m 17s longer. The Moon is a waning crescent, 24d 2h old with 35% illumination. Nikon D600, Sigma 105mm lens, ISO 320, f/3, 1/3200″ exposure.